This is the big brother of head-up displays. It features all the standard features such as current speed in km/h or mp/h, as well as a compass. 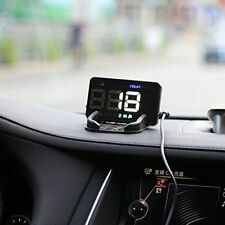 However, it also provides a tripmeter (distance travelled) and driving time, which can be extremely useful. The large 5.5” display ensures all information is large, clear, and easily read. Additional information is also provided such as current altitude and the number of satellites currently in range for precision. It’s a fantastic unit, and a great safety addition to your vehicle to ensure you keep your eyes on the road. Note: Check local regulations regarding installation position. Compliant installation requires position to be within fixed distances from the dashboard for some locations. Box Contents: 1 x GPS 5.5” Head-Up Display 1 x Anti Sli. Keep an eye on your speed without diverting your eyes from the road! Peripheral vision speedometers made their way into various production cars, but the concept never really took off. A head-up display turns your windscreen into the screen, by shining onto it from the dashboard. It means you can see, and look through the display, while still looking at the road in front of you. It’s fully self-contained, requiring nothing but power from your vehicle. A GPS sensor provides speed calculations, while an internal compass provides current direction. An adjustable over-speed alarm is very useful for motorway driving, displayed in km/h and mph. Adjustable brightness to match the conditions too. Includes an anti-slip dashboard mat, windscreen reflector & car cigarette lighter charger. Note: Check.